on the woodside. : *jog and hog. 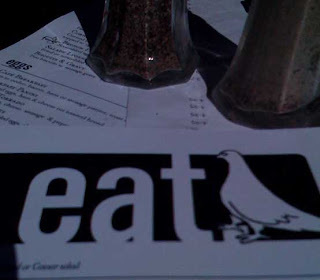 Monday, October 27, 2008 Labels: eateries. Frankly I'm disappointed in you, my readers. No one appeared to notice my mention of FIVE KILOMETER exercise-type activity. Full disclosure: I may have lopped off the end of the route in order to saunter back with J, T, and the Fatman. But there was running. That has to count for something. Buoyed by the mind-clearing, back-breaking (a woman of my—aherm—proportions is not meant to pound the pavement) jog, I was feeling peckish and wilting. All of that calorie burning was hard. So I decided to follow the recommended training regimen for any star athlete: I want a-foraging for cocktails and carbohydrates. It was the most incredible blue-sky day, and Jackson's has a wide, inviting patio with umbrellad tables and demanding menus. Fine, then. If you insist. I do have my usual menu quibble with this place. They're massive sheets of paper, just fluttering in the breeze and waiting for the merest gust to send them sailing across the street. Every manner of cell phone, salt and pepper shaker, and artificial sweetener container finds new work as a paperweight. My other complaint? They don't have coasters, so sweating drinks put your legs in their very own climate zone. It's always cloudy with a 70% chance of rain under the tables. Solution? Order a drink that doesn't require ice. Or, better yet, make your own. 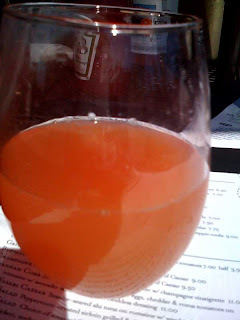 JLB fell in love with the blood orange mimosas, but they no longer make them. So she orders a bottle of their finest (read: least pricey) bottle (read: four) of Champagne (read: sparkling ... something). Then she jets over to the adjacent Tria Market, buys a bottle of blood orange juice, and mixes her own. Look at that bubbly sunrisey blush. 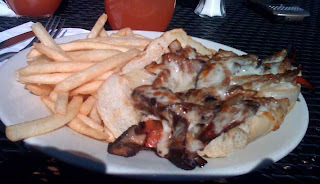 I was feeling indulgent (there was RUNNING), so I ordered the portabella cheesesteak—basically the usual Philly sandwich with mushrooms in place of meat. L Sis, a staunch fungus abhorer, struggled to watch me eat it. I'm pretty sure this meal shows up in her nightmares. It's not bad—I usually order it when I'm feeling expansive. And in the mood for melty cheese. I'd prefer a little less sauté on the mushrooms. I like them to still have some heft to them, as opposed to being waterlogged. The bread is just. too. much. And it pains me to say that, much as I adore my yeasty boyfriends. But it's an inch thick. It's like eating a nap. Then again, it's really just a sideshow for these. They're so good. I know they're fried and salted and taking up permanent residence in my cardiovascular system, but oh my yum. Yes, they're just run-of-the-mill frozen potatoes, but Jackson's has perfected the potato-to-crispy-outside ratio, and they don't drench the little tubers in salt. They are universally beloved by all mammals. See? 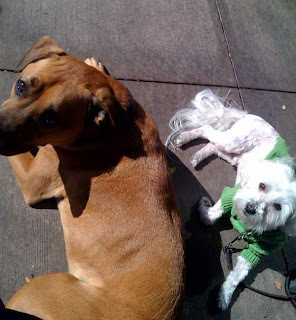 Yes, R is wearing a sweater. He is a delicate flower. He also wins the award for Best Begging Technique, as it seems J doesn't even understand the table orientation (Psst! It's behind you.). 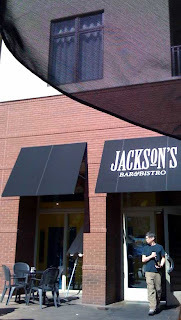 Jackson's is a tough call, because they have terrific outdoor seating, friendly people, and relatively reasonable prices. But the menu somehow manages to be textbook length with nothing to offer. You can stare and stare and stare at it, and you won't see anything jump out at you as a MUST-HAVE meal. The BLT is a little dry. The pasta is a teensy bit oily. The roast beef sandwich contains a questionable cut of meat. Even the wood-fired pizzas, a Jackson's claim to fame, suffer from strange flavor combinations or skimpy toppings. Things are just a bit off, or need better-quality ingredients to really sing. But it's OK. We'll keep going back. 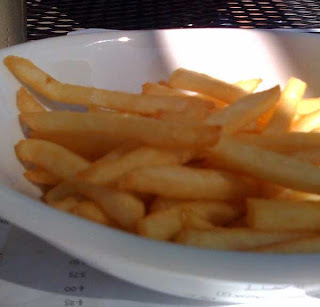 As long as there are blue skies and French fries. You ran a 5k and all you got was mushrooms??? Once Katie gets out of the boot we should all run a 5k together. You get a free t-shirt and the binge drinking afterward is completely guilt free. psh. you two run 5Ks in your sleep. Well at least you did something constructive before that. I just cut straight to the food and cocktails .... oh my liver, and heart, and stomach, arteries. no comment because you and j. do extreme endurance walks--backpacks and all in your sleep :). i bet you showed up everyone at the walk--did j. sport the pack? dante's pitchers of margarita are always guilt-free. dante is a foul, foul temptress.